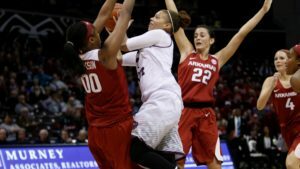 Missouri State’s Lexi Hughes hit a shot with 1.4 seconds remaining to give the Lady Bears a 64-62 victory and hand Arkansas (9-1) their first loss of the season, Sunday at JQH Arena. Hughes finished with 12 points, Liza Fruendt had a season-high 23 points, including five 3-pointers, Aubrey Buckley scored a career-high 14 points and Rachel Swartz grabbed a career-high 10 rebounds as MSU opened up a six-game home stand with its second consecutive win against the Razorbacks. Missouri State (3-6) led for much of the second half after shooting 9-for-13 in the third quarter, going on a 22-12 run over the final 8:39. Fruendt and Swartz scored to give MSU a 61-57 lead with 1:15 left before the Razorbacks completed a three-point play with 10.9 second for a 62-62 tie, before Hughes’ heroics. The Lady Bears return to action Saturday at 2 p.m. against North Texas (3-6).